Three stars of Rimini family run, the Hotel Villa Franco is located in a central and quiet area. It has a open-air porch with garden, private parking until all places, WI-FI for free throughout the property. It accepts small pets. 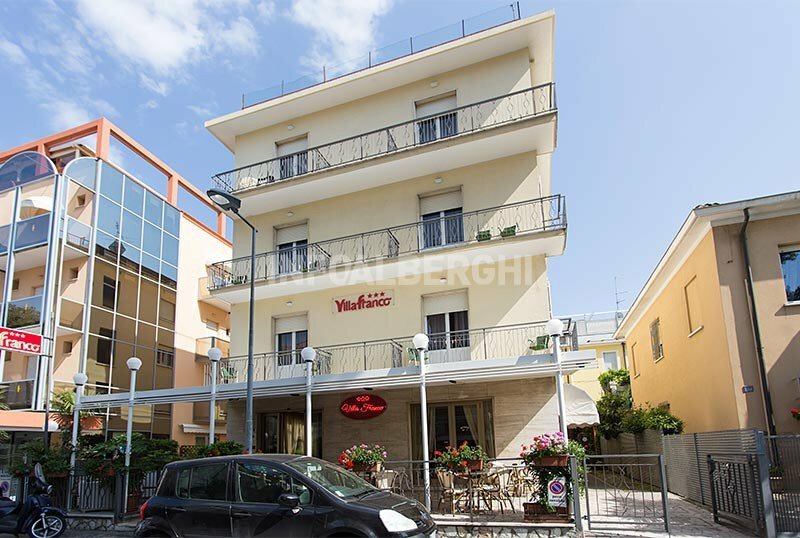 The hotel is located in Rimini in the Marina Centro area, on a cross street of the promenade from where you can reach the beach in a couple of minutes on foot. Using the bus n.11 (stop n.15), you can easily reach the railway station of Rimini and the center of Riccione in a few minutes. All are equipped with balcony, bathroom with shower, hairdryer, safe, telephone, TV, WI-FI and air conditioning. Some rooms have partial sea views. Open-air porch with garden, terrace, bicycles available, reading room, elevator. It organizes theme nights. PARKING: private and outdoor, available free of charge while seats last. AIR CONDITIONING: available throughout the entire hotel. CONVENTIONS: beach, amusement parks, discotheques, shuttle service on request. SERVICES FOR DISABLED: entrance with inclined ramp on the ground floor, wheelchair maneuvering space in the room, accessible shower. BREAKFAST: international buffet breakfast with homemade cakes and pies with salted dishes. LUNCH AND DINNER: the kitchen is managed directly by the owner and chef Domenico, to guarantee quality and freshness of the food. Every day meat and fish are served in two menus to choose from, with buffet of appetizers, vegetables, pizza and other appetizers. Water at meals is included in every accommodation package. VARIATIONS: On request à la carte restaurant, vegetarian, vegan and celiac dishes. The hotel has an agreement with the Bagni n. 51 and 52. - Third adult bed: -10%. - Meals not consumed in the hotel will not be reimbursed. - Booking deposit: € 50.00 for each adult (€ 100.00 for single room) to be sent by ordinary money order or bank transfer within 10 days of confirmation. - The listed rates indicated may be subject to change at events, fairs, parties and New Year's. Come and experience the New Year's Eve in the Riviera! Very special for the week of August! Package of 7 days in Formula All Inclusive € 550.00 per person. Call and ask for a personalized quote! EASTER AND 25 APRIL IN FULL BOARD DRINKS INCLUDED! Full Board Package with drinks at meals included: - 3 nights: € 195.00 per person - 2 nights: € 150.00 per person Family packages on request. All Inclusive package with beach service and drinks included! Valid for stays from 29 June to 27 July. Contact us now to not miss this fantastic offer!